The flyer giving you the dates of the markets between now and April 2019 has just been published and will be available at the market on Saturday, and all markets in the coming months. By picking up the flyer and keeping it somewhere at home, you’ll have the dates of the market handy for the next few months and you won’t need to worry about having the right date. 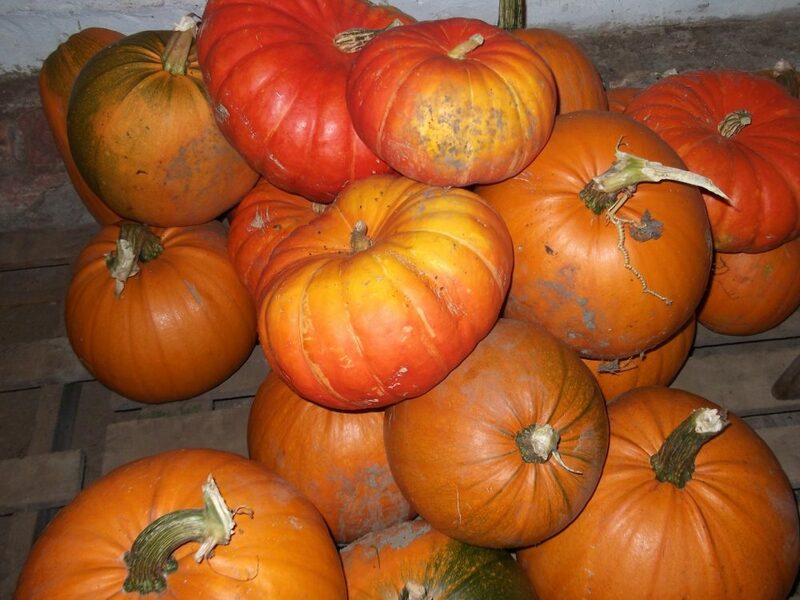 Hexham Farmers’ Market has now reverted to its winter hours which means that we’ll be closing at 1.30pm. You can get a pdf of the leaflet here. Saturday 27 October is the date of Hexham Spook Night, one of the biggest events of the year when Hexham is transformed into all things spooky. This fantastic family event attracts thousands of people into the town, many of them in fancy dress. However, to allow for the set up of a variety of rides on the Market Place, Hexham Farmers’ Market will finish at the earier time of 12 noon. We’re encouraging our traders to be there early and we strongly encourage both our regular and occasional customers to be there early. We look forward to seeing yourt there between 9am and 12noon. You can find more information on Spook Night here. 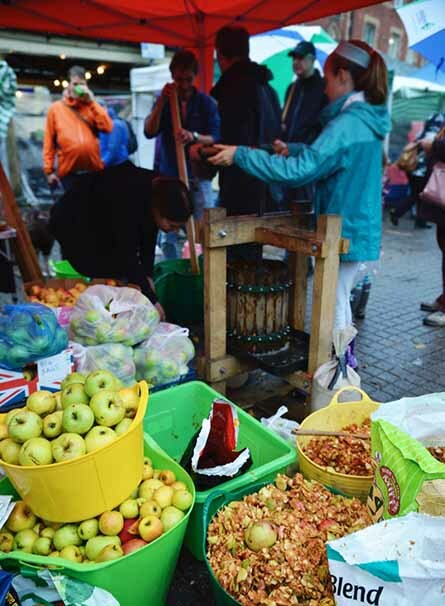 Any Market Manager fears a poor weather forecast and when you get messages from your traders in the run-up to a market asking if the market is likely to go ahead, you pay extra attention to the forecast! When you then find the day is likely to wet but not too windy, you set your expectations accordingly and hope for the best. Our Apple Day on 13 October was in the middle of the weekend when Storm Calum was in the news, but turned out to be an excellent day, despite the damp. Yes, it rained; yes, people got very wet, but our wonderful customers came anyway and supported their local farmers’ market. Our friends from Transition Tynedale did a stirling job turning the apple glut into bottles and bottles of delicious apple juice, Ros from Rookhope had her apple knowledge tested and provided customers with information and, crucially, names for their mystery apple varieties and everyone actually had a pretty good time! And when you get a wide variety of stallholders tell you they’re done well, you know the day was a success! We’re delighted that we’ll be joined on Saturday 11 August by the YMCA from Newcsatle with a new product for the market. They have set up a social entreprise which uses coffee waste from cafes in the city and turn it into high value oyster mushrooms. In the process they are not just producing a product but they are also training and employing young people. A win-win for all! You can find more about the business here . The market on Saturday 11 August 2018 starts at 9am and finishes at 2pm. You can find us in the Market Place in the historic heart of Hexham. 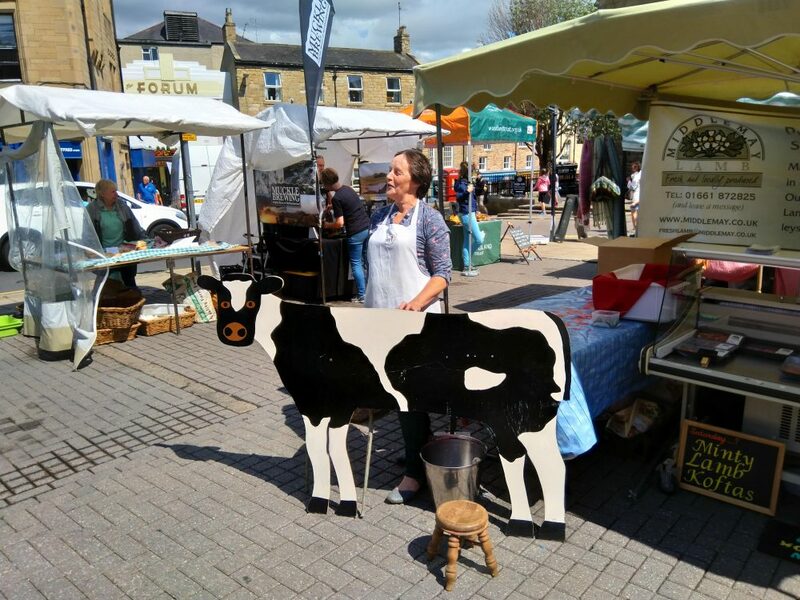 Carron of Middlemay Lamb brought her dairy cow Buttercup to the market on at the end of July. Buttercup gives children (and adults!) an opportunity to have a go at hand milking, which is a real skill. If you didn’t get to see her, we’ll try and let you know about Buttercup’s next appearance via our social media pages. 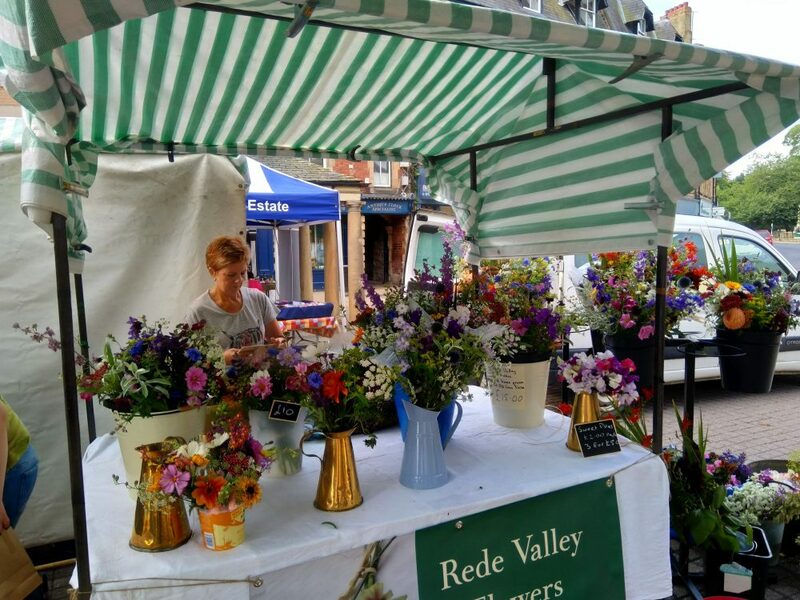 We delighted that we will have cut flowers from Northumberland at the market on Saturday 28 July 2018. Kate Kirsopp-Reed and her sister grow their flowers near Otterburn in the Rede Valley, a challenging place to be growing flowers! They will be trying the market as a guest.